NEUFC is a Hero Indian Super League team owned by actor John Abraham. The team is represented by the entire Northeast region and is united by its love for football. The matches are held in the Indira Gandhi Athletic Stadium in Guwahati, Assam. This season, the team is led by Dutch manager Eelco Schattorie and includes great players like Federico Gallego and Bartholomew Ogbeche. Gear up to cheer for your pride! Note - Operational only five days before every match. 1. Box Office - Gate 1C, Sarusajai Football Stadium, Nalapara, Guwahati. 2. 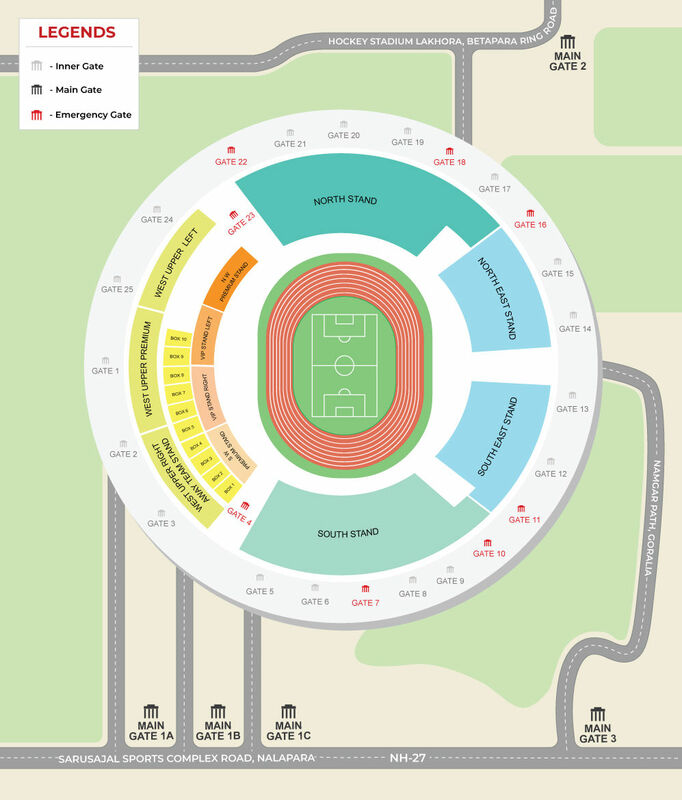 Nehru Stadium - Nehru Stadium, Haren Barua Road, Gandhi Basti, Sarania Hills, Ulubari, Guwahati. 3. Reliance Trends - Reliance Trends, Marba Hub, Police Bazaar, Shillong. 4. Reliance Trends - Reliance Trends, Bijaya crescent, Ground floor, 6th Mile, Rukminigaon, G.S.Road, Guwahati-781005. Entry to the Stadium is subject to acceptance by the Holder of the "Terms and Conditions", which include: these terms, those terms and conditions stated on the Ticket and any other Stadium– specific regulations which may be displayed at the Stadium, and all present and future laws, rules and regulations. Entry to the Stadium shall constitute acceptance by the Holder of all of the Terms and Conditions. The Holder acknowledges and consents to the recording of his/her likeness and/or voice and further acknowledges and agrees that FSDL is entitled to use and sub-license all rights in respect of such recordings without compensation of any kind to the Holder. The Organiser does not guarantee that the Holder will have an uninterrupted and/or uninhibited view of the Match from the seat provided nor does FSDL and/ or the Organiser give any warranty as to the quality, content or duration of the Match. Refunds (less any applicable administration fee), if any, will only be made if the entire Match is cancelled without a Match commencing. No other refunds will be made. The Ticket must be produced whenever demanded by FSDL, the All Indian Football Federation ("AIFF") and/or the Organiser, or each of their representatives. The Holder must comply with any reasonable instruction from any official at the Stadium. The Ticket will be valid until the relevant Match has been completed or is reasonably deemed by the Organiser, FSDL and/or the AIFF to have been completed. The Ticket may not be exchanged or used for any match or event other than that indicated thereon. If the Match is cancelled or curtailed for any reason, there shall be no obligation on the Organiser, FSDL and/or AIFF to reschedule the Match. The Organiser, FSDL and/or AIFF reserves the right to make alterations to the times, dates and venues of the Match or to substitute the seat or area to which the Ticket refers at its reasonable discretion.